Since being announced as a Fine Arts Academy in the spring of 2018, Lee Means Elementary has undergone much transformation in preparation for its arts-infused curriculum. Though this change may not be immediately noticeable in the outward appearance of the campus, one thing that will be hard to miss as students arrive on the first day of class is the massive piece of modern art that was recently installed at the entrance of the school. 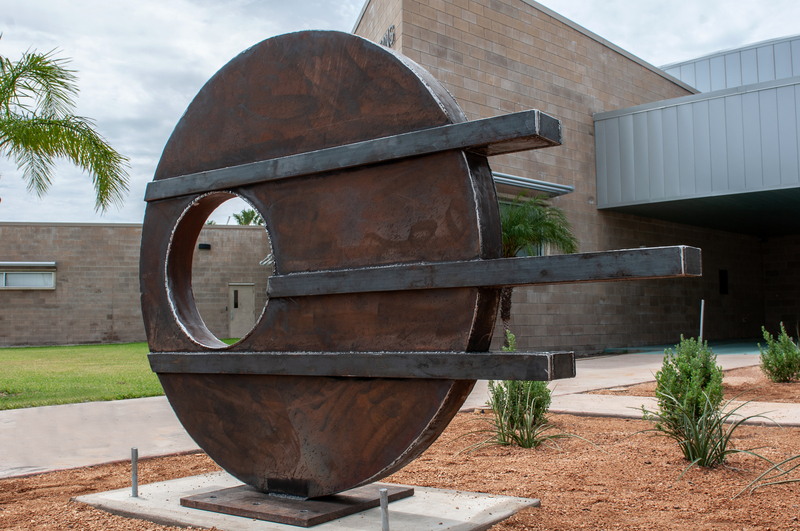 “I believe this is the first modern contemporary art piece in front of a public school in the Rio Grande Valley as far as sculpture and three-dimensional art,” said local artist Brian Wedgworth. Wedgworth spent weeks maneuvering, molding, and welding steel to produce a sculpture that celebrates growth and knowledge as well as encapsulates a new point of change in the chronology of Lee Means. The 2018-2019 school year brings a new learning experience featuring a unique and vertically aligned curriculum developed with a focus on four different pathways – dance, music, visual arts, and theater. Using the circle as a metaphor for life, Wedgworth documents stages in life. The repetition of the linear shapes represent practice and like a ladder’s rungs, with each repetition comes improvement and ascension. He and his wife, Aleida Wedgworth recently celebrated their 18th wedding anniversary doing what they love – working in their studio located in Harlingen, Titan Studio. Their artwork can be seen during Harlingen Art Night, held in Downtown Harlingen every last Friday of the month. Wedgworth attended the University of Texas-Pan American where studied sculpture under Richard Hyslin. His geometric based abstract steel sculptures can be found in several private collections around the U.S. and abroad. He also works with local developers and architects to incorporate his work in their projects including homes, apartment complexes, business, and education centers.